At the 2015 Scottsdale, Arizona collector car auction week, 42 cars sold for over a million dollars with a 1964 Ferrari 250 LM setting a new record price. Of the million-dollar-plus cars, 16 were Ferraris, 8 Mercedes Benz, 5 Selby Cobras, and 4 Porsches. RM Auctions sold 17 cars for over a million at the 2015 Arizona sale, followed by Gooding with 11, Barrett Jackson with 9, Bonhams with 4, and Russo and Steele with one. Notes: * Car sold during auction but after the hammer. ** Cars sold for charity. Not surprisingly, Ferraris lead the list of best results achieve at the 2015 mid-January collector car auctions in Scottsdale and Arizona. 16 of the million-dollar-plus results were Ferraris including the top three prices paid. 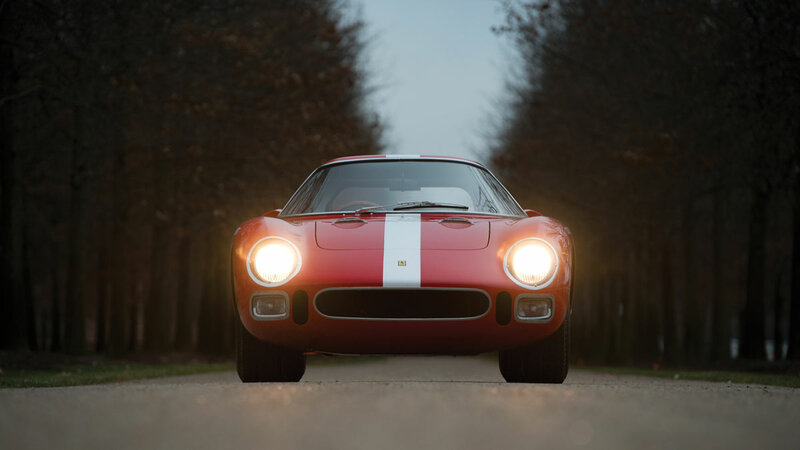 RM Auctions set a new auction week record when a 1964 Ferrari 250 LM sold for $9,625,000. RM sold 9 of the top Ferraris. Bonhams had the second highest result ever at Scottsdale with $9,405,000 for a 1966 Ferrari 275 GTB Competizione, which had the auction week record for a day before the Ferrari 250 LM crossed the block. Gooding & Co had the third highest result with $7,700,000 for a 1959 Ferrari 250 GT LWB California Spider. It also sold the fourth most-expensive Ferrari at the auction week – a 1962 Ferrari 400 Superamerica SWB Coupe Aerodinamico for $4,070,000. A surprise result was a new record $2,750,000 paid at the RM Auctions 2015 Arizona sale for a 1984 Ferrari 288 GTO. A further seven Ferraris received highest bids in excess of a million dollars, and three in excess of $3 million, but failed to clear the reserve margins. The two most surprising vehicles achieving a million dollars at the 2015 Scottsdale collector car auctions were the two GM concept vehicles sold by Barrett Jackson. The 1950 General Motors Futurliner Parade of Progress tour bus from the Ron Pratte Collection was sold for $4 million in aid of the Armed Forced Foundation. The 1954 Pontiac Bonneville Special Motorama Concept Car achieved $3.3 million. It was one of two concept cars built to help establish the Bonneville name for Pontiac. No fewer than 12 Mercedes Benz 300 SL cars were offered for sale at the 2015 Scottsdale auctions confirming that these beautiful cars are not exactly in short supply. Results were mixed: 7 sold for over a million dollars but 4 failed to clear the reserve margins. The highest result was $1,567,000 for a 1962 Mercedes Benz 300 SL Roadster at Gooding, which failed to sell the other three SLs on offer. 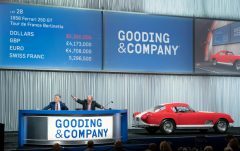 Gooding and RM Auctions had highest bids of $1,550,000 for 1962 Mercedes Benz 300 SL Roadsters but failed to clear the reserves – lower estimates for these two cars were around $1.7 million. Bonhams sold a 1957 Mercedes Benz 300 SL Roadster for $900,000 – a rare occasion for one of these cars to sell for below a million dollars. However, buyers also seem very unwilling to go to $1.5 million for a standard 300 SL without special provenance. The highest bid for a Mercedes Benz car during the auction week was $3.1 million for a 1937 Mercedes Benz 540 K Sport Cabriolet at the RM Auction Arizona sale (estimate $3.4-4.0 million). Five Shelbys sold for more than a million dollars at the 2015 Scottsdale auctions. The highest price was $5,115,000 paid at the Barrett Jackson auction for Carroll Shelby’s personal 1966 Shelby Cobra 427 Super Snake. The result was achieved post-hammer but while the larger auction was still in progress. At the same auction, the first 2015 Shelby GT350 R was sold for a million dollar in aid of charity. Barrett Jackson sold a further 427 for $1.6 million while two Shelby 289 Cobras achieved just over a million dollars. Two further Cobras sold for just less than a million. Four Porsches achieved over a million dollar at the Scottsdale 2015 auctions. The highest result was $1,980,000 for a 906 Carrera 6 at the Gooding auction – the highest result for a German car during the week. Gooding also sold a 959 Sport for $1.7 million. RM Auctions have two fairly similar Porsches: a 904 Carrera GTS for $1.65 million and a 959 Komfort for a million. Porsche 959s have increasingly achieved results in excess of a million dollar and more are likely to appear on the market at coming auctions. The top four auction houses at 2015 Scottsdale had very good sell-through rates (87-99%) but around 20 cars expecting to sell for over a million dollars did not clear the reserve margins. These included 7 Ferraris, 5 Mercedes Benz cars and 3 historic Chevrolet Corvette racing cars. A prewar 1929 Alfa Romeo 6C failed to sell at Barrett Jackson despite a highest bid of $1,210,000 while Aston Martins also failed to breach a million dollar – similar cars will be on offer in Paris in early February 2015 at RM Auctions and Bonhams.